Responsible blogging: is it an oxymoron? I think I’m finally beginning to understand the fear that some organizations grapple with when it comes to blogging. First of all, the nature of blogging itself goes against the grain of any institutional setting. My first job was in a multi-national scientific firm – they expected their staff to project a ‘corporate standard’, from what we said when meeting with clients to the way we dressed – it was all about image! So the idea of an employee writing an article from their perspective, that may or may not reflect the views of the organization must be scary. Last week, I attended a very interesting session on blogging. This was organized by the FAO knowledge exchange group and facilitated by Gauri Salokhe and Romolo Tassone, this session was aimed at starting discussion at FAO on blogs and their potential to support the work they do. To illustrate the point, several bloggers were invited to discuss how blogs were helping their organizations. The list included Maria Garruccio of Bioversity International who maintains the library blog, Roxanna Samii of IFAD who has both a personal and official blog, Michael Riggs of FAO who has a personal blog and yours truly, who blogs for the ICT-KM blog site along with at least 5 other colleagues. For an organization like FAO, this might have looked like collective ambush. But if the staff who attended were keeping an open mind, they would have noticed that the bloggers were responsible, mature individuals who recognized the value of their organizations. The bloggers with personal blogs made a clear distinction between what was private and institutional. They were careful not to represent the voice of the organization. Roxanna Samii echoed the sentiment of using common sense when dealing with content that may be deemed sensitive. For the institutional blogs, Maria, Roxanna and I felt results speak for themselves. The attention the blogs have received show that as a communication medium, institutional blogs are making waves. The ability to measure this impact with statistics (a feature of many blog sites e.g. WordPress) lends credibility. These blogs resonated with people and feedback was encouraging. The blog content featured may be updates to an event/ activity, but not limited. Maria has been promoting the library and new collections that arrive. Michael has been using his personal blogs as an avenue for his interests in knowledge management and new technology. I am using the ICT-KM blog site to introduce newcomers to social media – from a non-technical point of view. In short, our blogs have purpose and if they connect with others, it is because of the shared interest. Used responsibly, blogs become a meeting point for people with similar interests to learn and engage, besides being a great marketing tool for an organization to promote their work. Incidently, here’s an interesting post I read yesterday on why your non-profit organization needs a blog which may help tip the scales for blogging. Of course, there are challenges aplenty – most apparent TIME. But it was pointed out that time as a constraint does not exist if you are passionate about the topic. Blogging is just another way to get your message across and should not be looked at as an additional burden to your existing workload. The greatest challenge though is the mindset. Whether you’re a part of a large organization like FAO or a small ten-people company, the organizational culture is determined by it. And that is hard to change, though not impossible. Trust plays a big role – Meena says in all naivete. The knowledge exchange team advocating blogs for FAO are embarking on a huge effort, but they’re off to a great start in showing their staff success stories. The proof is in the pudding! I have talked in earlier posts about the blog “Embracing Change” that supports the sharing and documentation of the organizational change process of the CGIAR. In this post I would like to look closer at the learning curve and the progress that I have been observing and talking about with the team over the last 2 years or so. Learning curve step 1: The blog started in June 2008. At that time the CGIAR Secretariat had been tempted to do a blog for a while but it was really the beginning of the CGIAR change process that provided an ideal opportunity to experiment with this new media. Step 2: The beginnings were filled with uncertainties and questions: Who will blog? What should be the tone? Do we need an editing process? How often do we need to update the blog? How official is this site? And so on. These were all legitimate questions and ended up being answered with a relative conservatism: Let’s publish official messages from the CGIAR Chair Kathy Sierra! The advantage of this approach is that many people are interested in what the Chair has to say, the inconvenient being that the message has to go through a complete editing chain, and looses the personal tone to become very institutional which– the experience proves– doesn’t really make a blog thrive. Step 3: To boost the frequency of messages and subsequent traffic, it was decided to hire a blogger for some of the key CGIAR change events, the first being a stakeholder meeting in the Philippines in September 2008. Indeed the number of visits increased dramatically. In a related post, the event blogger Sue Parrott from GreenInk stated: “The blog, as a new channel and trendy media, generated interest among the meeting participants who responded very positively to my interview invitations. I could work very independently also I would almost have liked interviewees to be more controversial.” Due to the little experience everybody had with the blogging process, the team felt at that time necessary to revise the blog posts before posting them. The blog started to mix nicely photos, and videos with the interviews. Step 4: The experience was considered positive and pursued in December to cover the Annual General Meeting 2008 of the CGIAR in Maputo, Mozambique. Now, Sue Parrott could post her stories without revisions! Step 5: The Strategic Communications Meeting of the CGIAR included a great opportunity to meet with the CGIAR change Transition Management Team (TMT) and to talk about the best ways to communicate the change process. The need for a more personalized tone was emphasized by a lot of participants. This led the TMT members to follow the suggestion and write more frequent updates and to post those on the blog as TMT Journal updates. The recent donor meeting in London was another opportunity for live blogging. And new features appear on the site, like the Flickr photo gallery. That is where we are in our learning curve right now: The blog got more ownership, and became less formal in its tone; the statistics prove the concept, as the number of visits is growing. There is still a small number of comments, and sometimes it might seem discouraging, but from our ICT-KM blog experience it is urgent to be patient: People need time to find you, and they need time to feel comfortable enough to jump into the cold water and expose themselves to “everybody”. The next steps could include an agreement among the bloggers on who replies (more quickly) to the comments as this encourages other readers to contribute (Learning curve step 6: Always reply to the comments you get). The blog posts could also deal with and link to partner and center sites where related topics are discussed (Learning curve step 7: Cross linkages increase readership and help to raise the profile). And finally “somebody” should take over the flagship and listen to what others say about the CGIAR change process and related topics on the web, go to those sites and start an online conversation through comments and links. (Learning curve step 8: Social Media Listening is key for engagement online ). Congratulations to the blogging team for taking up the challenge and continuous improvement! When I started blogging in 2007 (see blue curve) I really didn’t know exactly how to do it, what to blog about and when or how often. It was a slow process and needed my patience and persistence. Then came a team meeting in May 2008 (red curve) and after a discussion on the need to communicate more, my colleagues started to join the adventure. Immediately the number of visits began to increase. This is a great success story and thanks to Enrica for pointing us to the fact that today we broke our record of daily visits. A fantastic team effort! What makes the Peer Assist a KS method? asks Michael. A tag is a keyword or term that is given to a bit of information (a bookmark, an image, a blog entry, etc.) in order to help find it later and also to associate it with other, similar or related bits of information. Many of the web2.0 tools we are discussing in our workshop make use of tags. Indeed it is because of these tools that tagging has become popular and widely used. Tags are chosen by the individual at the time they are put into use. They are more flexible than the formal metadata and can sometimes be used as leading indicators of new concepts. However, they can also be somewhat inconsistent and lack the relationship specification of defined taxonomies. When many users have tagged many items within an application or around a set of items, this collection of tags becomes what is called a folksonomy (i.e. an informal taxonomy generated by the people or “by the folks”). Social Reporting is the practice of capturing and sharing the learning that happen at F2F events online for the group and possibly others not at the F2F. Nancy launched this topic as a way to suggest some practice in this area during the f2f meeting in Rome. Here are some tools used for social reporting: wikis to take life notes from sessions and document them; online photo galleries like Flickr to upload each day visuals of the event; Live blogging to capture impressions or results of a session; video interviews to give a voice to participants and tell their own story and perspectives on the event, a topic or a session. Jo launched this thread with the question: Can anybody share stories about success and frustration on different discussion group interfaces? Which interface and provider to choose from for best result for all participants having and “equal position” in the group and possibility to manage email to customize involvement? When do blogs work well. Nancy shared a post from Pete Cranston to the KM4Dev community: be personal, less obviously institutional, update regularly, acknolwedeg that spending time on communicating your perspectives is valuable, have a group of bloggers for organizational blogs, be open, don’t control. “Blogs work when they are constructed and maintained so that they become part of the blogosphere, get linked to – and link to others – and generally have access to audience. Blogs designed for a bounded audience have a much harder time.” Blogs are also a welcome alternative to progress or back-to-office reports, or for specialist groupings that focus around meetings, or issues. Blogs versus discussion groups: Blogs are not tools for team communication. They can’t really replace email. Wikis are really rather flexible … not just as a shared document writing/editing tool, but they can be used as an entire website platform (with pages open for editing or not), as a growing knowledge base, like Wikipedia and the KS Toolkit, or even as a simple intranet. There are commercial wiki packages now that are pitched that way. Obstacles to broad wiki use: All members can overwrite; no track changes directly visible. Publishing of “unfinished material” => cultural shift. Needs accountability, rewarding and facilitation. Nancy shares some lessons learnt while doing wiki training session: Use any training opportunity to also build relationships; make sure there is hands on practice/use – don’t just talk about it; create a short “how to” document to send in advance with screen shots – but keep it simple; don’t over describe all the features the first time. Should we use a platform “one package solution” or should we integrate bits and pieces? Pete thinks that “there is no all-in-one package out there and even if such a platform existed to meet our staff needs today, this certainly is no guarantee that it will meet all of our needs tomorrow.” I think this is an important lesson for working with Open Source software as well as within the context of Web 2.0. At the end of the day, it’s all about interoperability and integration of services. If you have a system that can produce RSS and uses tags, then that content can be easily shared on other pages within your intranet. “Sharability” is a key feature. There is a group of intranet curios participants of this thread who meets a group of skeptical ones: No one really has an example of a successful intranet site; I am asking; How much information is there really besides financial and project management information that need to be closed and internally only? Or: “I’m also cynical enough to believe that some prefer to keep information on the intranet because there it is not likely to be questioned or challenged by “outsiders”. Sue Parrott from Green Ink. 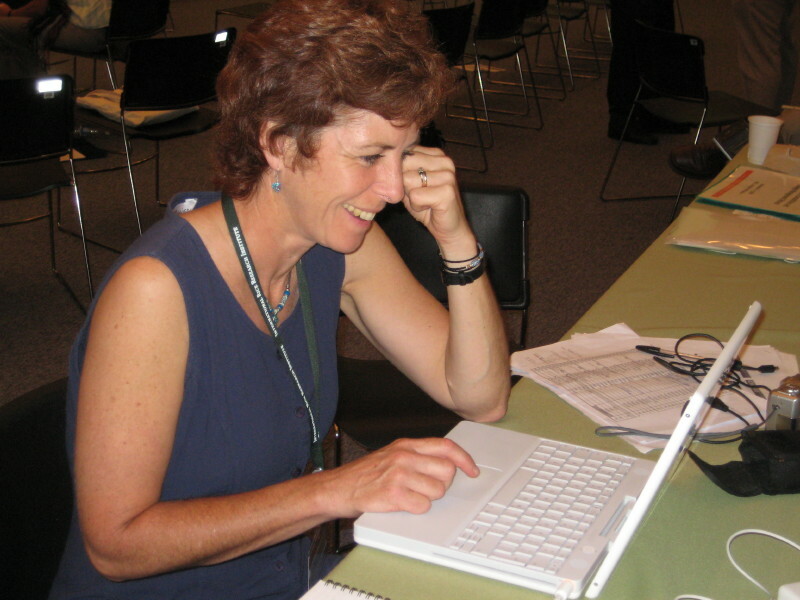 As I am participating in a meeting of the Change Management Process of the CGIAR at IRRI in Los Baños, Philippines I was happy to have a chat with Sue Parrott who took over the role of a live blogger during the event. Sue works for Green Ink., a UK-based communications consultancy, and has been reporting meeting sessions and interviewing participants in this event that aimed at engaging the Working Groups, and the Steering Committee with a whole range of stakeholders in a consultation process. Very soon –in less then a month—the Steering Committee has to make recommendations to the Executive Committee of the CGIAR, which will lead to final decisions about the future of our System during the Annual General Meeting in December this year. Stakeholder engagement is a crucial element of the whole process (see a related post reflecting the reactions of Ruth Haug from Norway) and the blog has been identified as one possible channel to convey frequent up dates and hopefully get some feedback. It has been really good fun. The blog, as a new channel and trendy media, generated interest among the meeting participants who responded very positively to my interview invitations. I could work very independently also I would almost have liked interviewees to be more controversial. Sue and I agreed about the importance of keeping the blog going actively until the December meeting at least, and to publicize it. Sue admits that this is her first event blogging experience and would love to get feedback about its usefulness: Does it give you information you can’t get elsewhere, is it timely? The blog covered the 3-day event with 15 posts, more then 10 of them being interviews of participants, many in video format. The Instiutional KS project has been working with the CGIAR Secretariat on stakeholder enagement and knowledge sharing issues over the last 3 years.